MISSISSAUGA, ON — The Sportop Midget AA’s OWHA Provincials Championship run has come to an end after dropping a 3-0 decision to the Toronto Aeros in a qualifier game for the Quarterfinals. The Midget AAs end their weekend with a record of 1-2-1, tying their first game 2-2 against the Waterloo Ravens on Thursday with goals coming from Brenna Nicol and Victoria Darosa, then beating the Peterborough Ice Kats 1-0 on a goal from Alexis Paddington on Friday morning before losing to the Mississauga Chiefs 3-0 Friday afternoon. NORTH YORK, ON — Coming off a 2-2 tie to open their OWHA Provincials bid, the Sportop Midget AA Queens looked to get their first “W” against the Peterborough Ice Kats. The Queens carried the play in the first, outshooting Peterborough 6-2 but failed to score on their opportunities. Peterborough came back with a vengeance in the second, outshooting the Queens 12-6, including a dangerous powerplay where they managed 6 shots on net but Queens goal Kamryn Sandelovich shut the door on the Ice Kats. The scoreless draw looked like it would maybe hold up but with 6:18 left, the Queens finally got their first powerplay of the game and went to work. Brenna Nicol fed the puck to the point to Brynne Lambert who’s shot would get deflected in by Alexis Paddington with 5:40 left in the game. Peterborough pulled their goalie in the final minute. Nicol had a chance to put the game away with 30 seconds left but hit the post of the empty net. Peterborough pressed but Sandelovich stonewalled the Ice Kats, making 23 saves in a 1-0 shutout. Shots were 23-19 for Peterborough. In their afternoon tilt with the undefeated Mississauga Chiefs, all of the scoring went in the other direction as Mississauga opened up a 2-0 lead in the first. The Queens outshot the Chiefs 25-20 but couldn't find the back of the net. Mississauga would add one more as Thunder Bay suffered their first loss to the tournament. The Sportop Midget AA Queens Saturday schedule is to be determined. Queens fans can follow along at http://owha.pointstreaksites.com/view/owha/events-416/provincials-1 just use the dropdown and choose “Midget AA". ETOBICOKE, ON — Although four Queens teams are in Southern Ontario taking part in the OWHA Provincials, the Sportop Midget AA Queens were the only ones in action on Thursday as they took on the Waterloo Ravens. Goaltender Josée Robinson got the start for the Queens and she’d get the bulk of her workload in the first as the Ravens outshot the Queens 10-3. Waterloo would score after a funny bounce at the crease and then add to their lead in a net-front scramble where the net came off its moorings. After some discussion among the officials, it was determined that the goal would stand. 2-0 for Waterloo after one. Thunder Bay got to their game in the second as Brenna Nicol scored off a perfect deflected on a point shot from Jessie Scott just as a powerplay was expiring. The Queens tied the game 3:51 later when Captain Victoria Darosa's shot from the outside would get partially stopped by Waterloo's goalie but not enough as the puck squeezed through and trickled into the net. Scott and Molly Kunnas drew assists on the goal. Shots were 10-8 Queens in the period. In the third, the Ravens looked like they took the lead, jamming home a puck on the powerplay but the net was again found knocked out of place. The hockey gods judged in the Queens favour this time though as the goal was disallowed and the 2-2 tie stood as the final score. Waterloo edged the Queens is shots 24-22. The Sportop Midget AA Queens play the Peterborough Ice Kats Friday morning at 8:00am before meeting the Mississauga Chiefs that afternoon at 1:45pm. 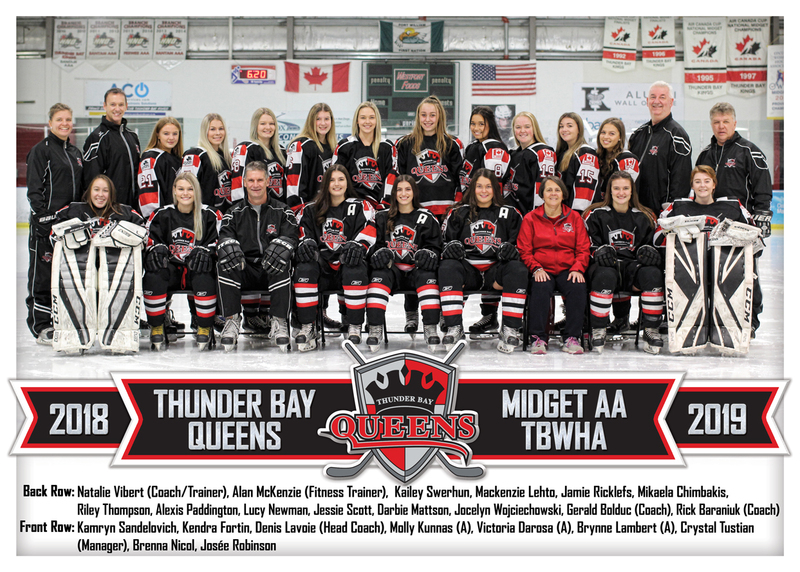 ©2019 Thunder Bay Queens Hockey Organization / SportsEngine. All Rights Reserved.